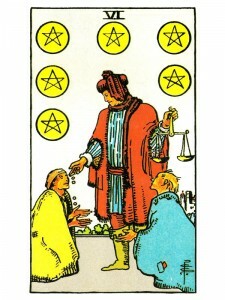 Six of Pentacles shares success through physical attainment and accomplishment. A happy atmosphere surrounds you – good things are beginning to happen – you are about to enjoy the fruits of your labor. STOP WORRYING! You will receive what is rightfully yours – the bread thrown on the water of life will come back threefold. You are offered the gift of success in relationships, achieved through generosity of spirit and the sharing of your resources as each persons wants and needs are considered equally. Love gives you a feeling of abundance that you share with no fear of running out, for you KNOW now that it is an infinitely renewable resource. Experience the success of producing those things which have deep internal motivation or inspiration for you – bring your resources together and create an alliance of power and success. Organize, co-create, make things happen by using all available ways and means. Religion and esoteric teachings give you what you are capable of receiving – “life” gives you what you need and what you can use. Place yourself in a position to receive and the force of life can overpower you with spiritual wonders. To consciously be able to give people what they need and can use, rather than what they “think” they want – you must first achieve a great degree of self – knowledge and awareness of human psychology. The value of study results not only in the specific knowledge gained – but in the frame of mind that is created by the “act” of doing it. The work changes you. You develop these changes consciously and deliberately by contemplating and joining – allowing yourself to receive the “gifts” of knowledge. The emotions at work in the Physical/material plane, as duty and service make themselves felt, as you begin to see others as extensions of self. The hermetic dictum “as above, so below” begins to take physical effect and assert itself to become reality. You become physically demonstrative, openly appreciative, interactive, as dependable for others as you have become for yourself. Giving and receiving. Material generosity, presents/gifts, charity, philanthropy. Physical favors and volunteering. Giving from the six level is rarely anonymous and family will always come before close friends, close friends before community, local community before state, state before country, country before world and then lastly universal, metaphysical good. After all, this is pragmatic philanthropy. Paying off dues/fees/taxes for the collective good. Paying your way and then some. Sacrifice – accepted obligation, duty. The ability to accept, to receive from others, to give thanks. We are as obliged to accept for our needs as we are to share from our abundance. Physical recognition. How are you sharing the wealth of money, talent, information? Next to Star: Don’t give up – you are entering a new cycle and it is important that you keep trying. In the first position: The progress made in your Material Plane will allow you to practice the lessons of generosity. And while you may be fortunate enough to be a patron of society as well, your major efforts will be in supporting and encouraging your loved one and closest friends as an extended family. In the second position: Your having participated in the lessons of give and take have prepared you for the unpredictable in your physical/material plane. You and your extended family can move as a unit in time of trouble to meet any foe, rise above any disaster. In the third position: Balanced giving and/or receiving in your Physical/material Plane are most important now. Your circumstances probably make it fairly obvious which you need to consider most. If not, the reading is dedicated to this subject and will shed the necessary light that you need. In the fourth position: One can imagine this passion as being one similar to Mother Theresa’s, except that she has already included the family of man as her personal family. This is the passion that drives the devoted matriarch or patriarch of an established family or the hard working mother that comes home and cooks for a large family and then volunteers to cook for the church bazaar on Saturday. In the fifth position: You are already aware that you are in an expansion of your abilities, your concerns in your Physical/material Plane. Whether you have been doing well yourself and will now be able to help others or you have decided to accept help from others, you will have advanced the cause of your material path. In the sixth position: A material exchange is in the near future. More than the actual benefits or outfall in the material level will be the effects on your relationships or creative affairs. In the seventh position: A material exchange is in your near future. The major impact of this transaction will be in your Mental Plane. For example, if this is financial backing for schooling or a project toward your goals. In the eighth position: Money or material assistance is flowing in or out of your coffers. This exchange is proper for the giver and the receiver. In the ninth position: Your heart has accepted a commitment and the fact that this card is here suggests that perhaps it is only the subconscious and not the conscious mind that has this view of the situation. If your mind eventually agrees, then you will accept this burden or this gift, whichever the case may be. In the tenth position: A situation requiring balanced giving and/or receiving will arise and be most important in the near future, not longer than a year from now. Your circumstances should make it clear which is the case. If not, the reading will shed the necessary light that you need.